Contemporary culture is permeated with the caustic message that nothing is more important than youth, and that the natural aging process is to be dreaded, denied, postponed, avoided at all costs. The media crams our minds full of dreadful data of aging as a dire collection of disease, devastation, and loss. Cultural perspectives foster a fear of aging which dramatically affects our experience of growing older. Despite those gloom and doom prognostications, a positive and life-affirming perception of aging is taking root in America and around the globe. A much-needed shift is emerging; a cultural shift that views growing older not as a relentless march to the grave, but as a fresh opportunity for using our increased life span to explore new levels of awareness and personal power. The truth is that we weren’t created to blossom early and then spend the rest of our life withering away. The time has come to challenge the myth of decline and to celebrate our new gift of longevity which is truly wondrous. This loving book is a beautiful fresh approach and shift that can help us embrace aging. No longer do we need to just grow older, rather, we can say goodbye to the conventional stereotypes and limitations and look at aging with a new perspective. 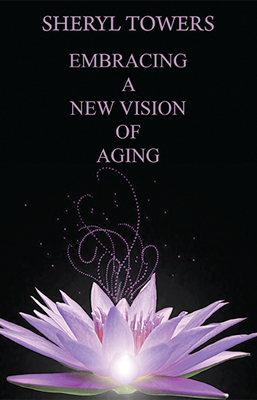 Sheryl Towers’ book affirms that we must be careful to not buy into the old ways of thinking but to embrace a new vision of aging for ourselves and like minded people. If you want to live happily, healthily and passionately at any age, then it is time to challenge traditional outdated thinking and embrace a new vision of aging for now and the future! Highly recommended! This book addressed the negative stigma associated with the belief system we seem to have bought into regarding aging as the end of life as we know it now experience!!!! it is not something to be dreaded that we go into kicking and screaming but rather something we should move through with fun, laughter, enjoyment , and wisdom. The view we may have of aging can be redefined and embraced!!! Complete the form below and send me a message.